IT is easy to feel like you are a little closer to heaven sitting inside Queensland’s highest church. Situated almost 1000 metres above sea level, St Joseph’s Church at O’Reilly’s Rainforest Guesthouse, near the Queensland/NSW border, has a special place in the hearts of the O’Reilly family who still run the mountain retreat. Fifty years after it was relocated to O’Reilly’s, the family is preparing for a big weekend of celebrations on November 26-27. The small wooden church, which was formerly part of Beaudesert parish, returned to the care of the O’Reilly family more than a year ago. The O’Reillys have been a pioneering Catholic family in the district, on the edge of Lamington National Park, since 1911 when they set out to graze dairy cattle and to carve out a new home in the dense sub-tropical rainforest of the Border Ranges. When Lamington National Park was proclaimed in 1914, the O’Reilly boys, Herb, Luke, Mick and Bernard, became honorary park rangers. The area started to attract an increasing number of visitors and this spurred the family to think about tourism as an adjunct to dairying. In 1926 the family built the first guesthouse in the mountains. To reach it was an arduous two-day journey from Brisbane, the last stage on horseback as there was no connecting road until 1947. In 1937, Bernard O’Reilly made headline news when he cut his way through the mountain rainforest to rescue two survivors of the Stinson plane crash. His heroic efforts are now part of Queensland history. In 1955, St Joseph’s Church, built in 1881, was moved from Gleneagle near Beaudesert to a small plot next to O’Reilly’s Guesthouse. Four hundred people somehow packed the small church for its blessing and opening by Archbishop James Duhig of Brisbane on November 27 of that year. 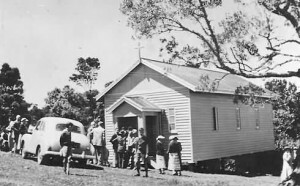 But the first Mass on the O’Reillys’ property was celebrated in an old slab hut in 1922. For many years after that, “Goblin Wood”, the home of Bernard and his wife Viola, hosted a mountain chapel until St Joseph’s Church was relocated to O’Reilly’s. Managing director of the family company, Shane O’Reilly, recalls receiving the sacraments in the wooden church and being a young altar server at Masses. He says the church has been a part of growing up as an O’Reilly on the mountain for three generations. It has hosted baptisms, first communions, confirmations and weddings for many of the clan. Catherine O’Reilly, who shares the family’s strong connection to St Joseph’s, has been researching its history. “We see the church as an important part of the family’s history and an ongoing memorial to those who went before us and their strong faith,” she said. The O’Reillys have always been renowned for their hospitality. Shane said 15,000 people stayed at the guesthouse last year and thousands of others come up the mountain for day trips. That same hospitality has extended to St Joseph’s Church. Thousands of visitors have either prayed or attended Mass in the church over the past 50 years. “A lot of people come up here looking for a place of retreat or spiritual reflection,” Catherine said. “We have also hosted many priests over the years,” Shane added. The O’Reillys have built a self-contained room off to the side of the church’s altar, allowing priests to celebrate daily Mass during their stay. Among the regular visitors have been Bishop Eugene Hurley of Port Pirie, as well as priests from around Australia who have heard of the beauty and tranquillity of the rainforest retreat. In preparation for the church’s golden jubilee, the O’Reillys have refurbished the pews and have commissioned a memorial stained glass window featuring Vince O’Reilly, who died in 1999. This memorial window will be blessed during the jubilee celebrations. The 50th anniversary celebrations will begin with a 5pm Mass in the church on November 26, led by Fr Leo Coote, a Brisbane archdiocesan priest with a close connection to the O’Reilly family. This will be followed by a 10am Mass the next day, celebrated by Beaudesert parish priest Fr Bernie Gallagher. The O’Reillys have extended an invitation to anyone with a connection to the church or the family to join them on the mountain for the celebration weekend.